Breakfast, dinner or s’mores with Santa Claus, a miniature train ride to the North Pole to see jolly Saint Nick, watching the fella in the red suit ride in on a trike motorcycle. There are many options in Wichita to see Santa this season and get photos with children or even fur babies. What could be more majestic than a Santa sighting among one million glittering lights? Illuminations at Botanica, Kansas’ most grand Christmas light display set among 17 acres of gardens, runs seven days a week from 5:30 to 8:30 p.m. through Dec. 31 (excluding Dec. 24 and 25) and features nightly Santa appearances. Tickets are $8 ($7 members) for adults and $6 for ages 12 and under. Botanica also offers Supper with Santa events – all five nights have SOLD OUT for this year – giving families an intimate experience of dinner, dessert, arts and crafts and a story read by Santa. Santa photos are available 5:30 to 8 p.m. Friday through Sunday (except Christmas Eve and Christmas Day) at The Arc’s Lights drive-through light display with 1.9 million lights. The display runs through Dec. 28 and starts at Douglas and St. Paul. Admission of $10 per carload is required Friday and Saturday, donations accepted Sunday through Thursday. Saint Nick is available for photos at the free Bringing in the Greens event Dec. 2 at Great Plains Nature Center. From 6 to 8 p.m., join the nature center staff for caroling, bell ringing and decking the halls with boughs of cedars and homemade ornaments. Holiday cookie decorating will be in the classroom, winter story time in the observatory and a live owl program in the Koch Habitat Hall. Owl’s Nest gift shop will offer a 15 percent discount on all purchases. 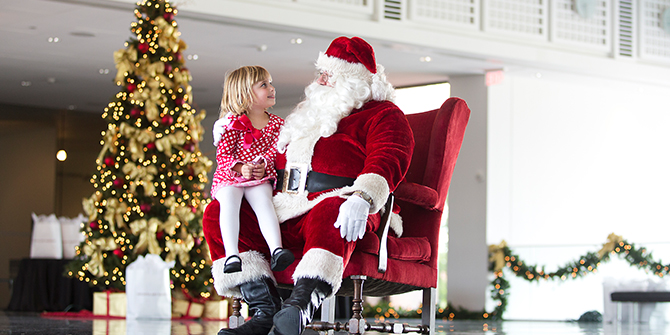 Towne East Square offers visits with Santa daily through Dec. 24 in the lower-level of the Sears wing. The mall also is hosting a Sensitive Santa event from 10 to 11:30 a.m. Dec. 4 when special-needs kids can experience Santa with lights dimmed and no music before the mall opens. Guests can register in advance at http://simon.com/caringsanta. Another special event Dec. 11 allows pet owners to fetch pet photos with Santa from 6:30 to 8 p.m. Visits with Santa are free, professional photos cost. Towne West Square is hosting a free Breakfast with Santa event from 10 to 11 a.m. Dec. 3. There will be a hot meal, crafts and a meet and greet with Saint Nick for the mall’s KidX members (memberships are free and can be joined at the event). The mall also is hosting a Sensitive Santa event from 9:30 to 11 a.m. Dec. 4 when special-needs kids can experience Santa with lights dimmed and no music before the mall opens. It’s free to register for Towne West’s Sensitive Santa and walk-ins are also welcome. They also have a pet photos with Santa event from 6 to 8 p.m. Dec. 11. Watch Santa arrive on a Harley-Davidson trike at 1 p.m. Dec. 3 at Alefs Harley-Davidson. Take your own photos with Santa and Mrs. Claus, who will be handing out goodie bags. Meet Kris Kringle from noon to 2 p.m. Dec. 3 and Dec. 10 at Exploration Place. The Meet Santa event will be in the main lobby so museum admission is not required. Seats are limited on the popular Polar Express at the city’s O.J. Watson Park and you can reserve yours by calling 316-529-9940 or visiting www.wichita.gov/parkandrec. This family activity costs $15 per person is geared toward children 2 and up and starts with a reading of “Polar Express” with milk and cookies. Enjoy crafts and activities, then take a ride on the miniature train to see Santa at the North Pole, where you’ll have s’mores and hot chocolate. The event is at 12:30 p.m. and at 2 p.m. Dec. 3-4, 10-11, 17-18 and at 6 p.m. Dec. 23. Spend the afternoon of Dec. 4 with Santa at the Wichita Art Museum during their Holiday Open House. From 2 to 4 p.m., museum admission is free and guests can visit with Saint Nick while enjoying musical performances and Christmas cookies. Meet and take photos with Santa and a live reindeer at Wichita Park & Recreation’s A Night with Santa event from 6:30 to 8:30 p.m. Dec. 8 at Century II Exhibition and Convention Halls. You can even write Santa a letter at this event, which also includes drawings for decorated trees and bicycles, face painting, inflatables, carnival games and bingo. The event is free, however donations of non-perishable food items for Kansas Food Bank are encouraged. Food and drinks will be available for sale (cash only). The drawings are held at 8:15 p.m.
Santa will be at the Sedgwick County Zoo’s Children’s Farms Festival: Holiday in the Barn from 1 to 4 p.m. Dec. 17. Play with farm toys and see animal demonstrations including animals found in a manger. Stop by the Plaza Beastro for hot chocolate, and don&apos;t forget to peruse the gift shop for the animal lovers on your list. Regular admission applies. Have Breakfast with Santa from 9 to 11 a.m. Dec. 17 at Old Cowtown Museum. While waiting for Santa to arrive by stagecoach, guests can make some fun Christmas crafts and send a personalized telegram to the North Pole. Breakfast includes pancakes, French toast, scrambled eggs, bacon, sausage, biscuits and fruit salad.​​​​​​​ Tickets ($7.95 for ages 4-15, $12.95 for ages 16 and older) must be purchased in advance at www.wichitatix.com. Stearman Field Bar & Grill – on a private airport where restaurant seating is just a few yards from the active runway – is serving its breakfast buffet from 9 to 11 a.m. Dec. 17 and welcoming families to come out to Benton for Breakfast with Santa and his reindeer Dasher. A full holiday event calendar is available at www.visitwichita.com/holiday/. Download the free Visit Wichita mobile app available for Apple or Android smartphones and tablets.